Third revised edition, loaded December 24, 2018. The king said: 'How could the Supreme Lord, being loved as a friend, equally disposed towards all living beings, oh brahmin, in support of Indra kill the demons, as if He would be partial [see also B.G. 9: 29]? Being of the highest bliss and free from the material modes, there is for Him absolutely no personal need to side with the enlightened community or fear and fight the demons. The honorable rishi said: 'What an excellent question to ask, oh great King! Because of the wonderful activities of the Lord, that are sung by the leading souls of piety, the sages headed by Nârada, we see more and more the glories and devotion of His devotees. I will discuss with you all the topics relating to the Lord, but let me first offer my obeisances to Krishna's greatest sage [Vyâsadeva]. Even though He is free from the modes, unborn and unmanifest, the Supreme Lord, transcendental to the material world, enters the material qualities of His illusory energy [in the form of the guna avatâras Brahmâ, S'iva and Vishnu] and accepts obligations and responsibilities [compare B.G. 9: 11]. The qualities of sattva, rajas and tamas belong to material nature and not to the spirit soul, oh King. For the spiritual self there is no question of their combined prominence or decay, the on and off [of the fickleness one has with material things]. The way one knows fire as residing in other elements [like wood], the sages, the expert knowers, perceive the Supersoul as present within themselves and this [divine self] is not visible when one looks at all appearances in the outer world [see B.G. 10: 10]. When He desires to create material bodies for the living entities, the Supreme One manifests them on the basis of His creative potency in the mode of passion. Desiring to engage in different bodies He is of the nature of goodness and when the Lord is about to put an end to it all He, in accordance with that quality [of destruction], engages the mode of ignorance [see B.G. 9: 10]. Oh ruler of man, the true cause that is the male principle, the original unmanifest foundation of matter [pradhâna], is the [primal, expanding] movement of time [as the fourth dimension] which forms the shelter of the Lord [to meditate upon, see also B.G. 11: 32]. Oh King, also being this [authentic notion of] Time, the Supreme Lord of name and fame increases, in the mode of goodness, the numbers of enlightened souls and is consequently, as the friend of the demigods, inimical to and destructive with the unenlightened souls [the materialists] who are ruled by passion and ignorance. Concerning this [destruction/protection plan] in the past upon the request of King Yudhishthhira, the man without enemies, the following story was lovingly told by the great sage of enlightenment [Nârada] at the grand sacrifice. The king, the son of Pându, after having seen how at the great offering called Râjasûya the King of Cedi [S'is'upâla] so wondrously had merged into the Supreme Personality of Vâsudeva, had as the ruler wonder-stricken at the sacrifice, before all the sages listening, asked Nârada who sat there the following question. Yudhishthhira had said: 'Oh how wonderful, and for sure difficult to achieve for even the transcendentalists, is the attainment of S'is'upâla behaving so hostile towards Vâsudeva, the Supreme Absolute Truth. We all would like to know how this could happen, oh sage; from insulting the Lord Vena was sent to hell by the brahmins. That sinful son of Damaghosha fostered, from his earliest prattle to his last days, anger towards Govinda, just as did the evil-minded Dantavakra [his brother]. No white leprosy appeared on their tongues nor did they land in the darkness of hell because of their repeated offenses against Lord Vishnu, the Supreme Personality of Brahman [compare B.G. 10: 12]. How could they for everyone to see, so easily find absorption [sâyujya-mukti] in the Supreme Lord whose supreme position is so hard to attain? The son of Vyâsa said: 'After hearing the words of the king asking questions in the midst of the assembly, Nârada, the greatest among the sages, felt satisfied and addressed him about the topics. S'rî Nârada said: 'This body, subject to insults, praise, honor and dishonor, is the product of a lack of discrimination between the primal state of material nature [pradhâna] and the supreme [position of the transcendental witness] oh King [see also B.G. 2: 14, 12: 18-19]. Oh earthly ruler, because of this the living beings in this world suffer from the misconception of 'I' and 'mine', just as from the reproach and punishment associated with it. Living with this false conception one thinks that the destruction of bodies is the same as the destruction of living beings. The misconception [including the reproach and the fear for punishment] is there not because of [Him but because of being without Him,] Him who is the beatitude of detachment and emancipation in person. How could there from His side, the side of the Soul of all, the Supreme One and Highest Control, be any question of violence [mentally and physically]? Therefore, whether one is of a constant enmity, of devotion, of fear, of affection or of lusty desires, one must manage to stay connected and not care about anything else. The absorption in Him [though] attained by someone in enmity might not be the same as the absorption attained by someone in devotional service, that is my definite opinion. A larva checked by a bee in a comb may be filled with anxiety and resentment, but because of that bee attain the same form. Just the same one may [like S'is'upâla and Dantavakra] with Krishna, who as the Supreme Lord assumed a human form, [even] be freed from one's sins by constantly thinking of Him in enmity. Moved by lust, hatred, fear, affection and devotion many, who united their mind in the Lord, consequently gave up on sin and thus attained their destination. Oh King, the gopîs realized this by their lusty desires, Kamsa by his fear, S'is'upâla and other kings by their hatred, Krishna's family members by their kinship, You [Pândavas] by your affection for Him and we through our bhakti. Not to be someone like Vena, who could not adopt any of these five forms of respect in regard of the Original Person, one must fix one's mind on Krishna in one of these ways. S'rî Yudhishthhira said: 'Who pronounced that curse and what kind of curse was that? It is difficult to believe that such a thing might happen to a servant of the Lord. How can it be that those exclusively devoted to Him have to take another birth [see B.G. 4: 9 and 8: 16]? S'rî Nârada said: 'One day it happened that the sons of Brahmâ, Sanandana and the others [the Kumâras], traveling around the three worlds, arrived at the place where Vishnu resides. When they [Jaya and Vijaya] saw them approaching who, despite being born before the ancients of the universe [see 1.3: 6], looked like boys of five or six years old, the two guards thought they were naked children and denied them access. The two were thereafter born as the sons of Diti and by the Daityas and Dânavas honored as Hiranyakas'ipu, the older brother and Hiranyâksha, the younger one. Hiranyakas'ipu was killed by the Lord appearing in the form of a lion [Lord Nrisimhadeva] and Hiranyâksha was killed by Him when He in the form of a boar had appeared to uplift the world [Lord Varâha, see 3.18-19]. Hiranyakas'ipu, desirous to kill his son Prahlâda, the beloved devotee of Kes'ava, tried different ways of torture to cause his death. But, since his son was protected by the power of the Supreme Lord, Him, the Soul in all living beings who is peaceful and equal towards all, he, with all the might he displayed, could not kill him. Next the two demons, with the names of Râvana and Kumbhakarna, took their birth from Kes'inî as the sons of Vis'ravâ and caused a lot of trouble to all the people. In order to relieve the two of the curse, thereupon Râmacandra manifested Himself and killed them. You will hear about the exploits of Râma [see 9: 10 & 11] from the mouth of Mârkandeya, my best. In their third birth the two were born in this world as kshatriya sons [as S'is'upâla and Dantavakra] to your aunt. They are now freed from the curse by Krishna who destroyed their sins with His cakra. 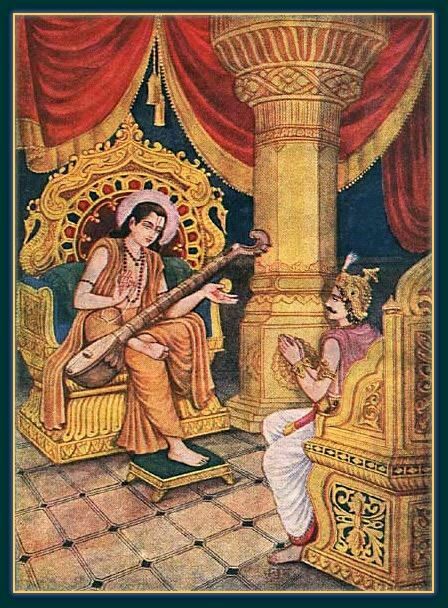 The image of Yudhishthhira talking to Nârada is from the Kalyana Kalpataru 1959. Source.